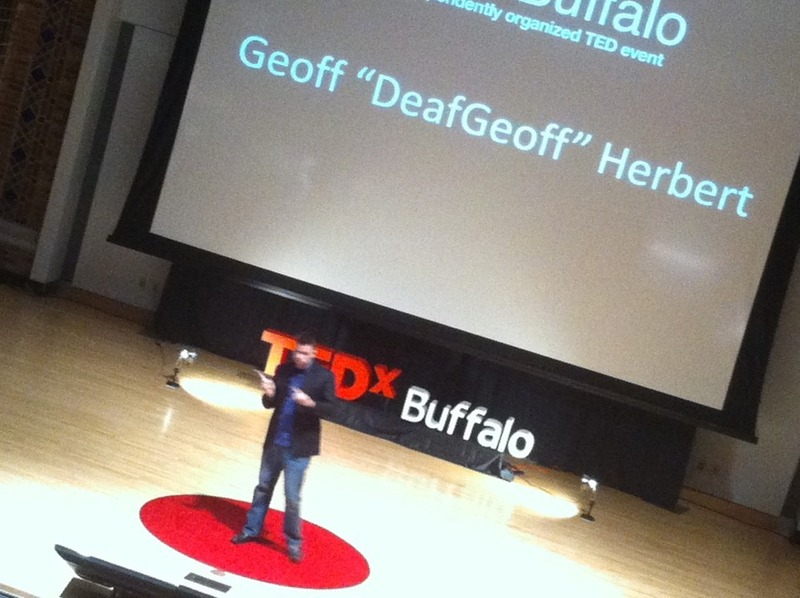 Geoff ‘DeafGeoff’ Herbert talks at TEDxBuffalo on Oct. 9, 2012 about being a deaf DJ and the importance of listening over hearing. I was humbled and honored to be invited to speak at TEDxBuffalo, my first TED (Technology, Entertainment, Design) event, about being a deaf DJ and the challenges I’ve faced in my life growing up mostly deaf. The event was held Tuesday, October 9, at Canisius College in Buffalo to an invite-only crowd and was also live-streamed online and recorded for future events. In a speech titled “Listening Is More Important Than Hearing,” I shared how I was born with a profound binaural hearing loss and learned how to communicate through years of speech therapy. I demonstrated some of the challenges that come from lipreading, such as how “V” and “F” look identical but the sound is different by how much air comes out of your mouth and whether your voice box vibrates when saying it. I then talked about falling in love with music, and its transformative power that led me to pursuing a career in radio — and never once letting my “disability” stand in the way. I learned to appreciate music by listening to it, not just hearing it, and worked hard at radio stations in high school and college before landing a job at Clear Channel’s HOT 107.9 in Syracuse as a morning show producer and sidekick known as “DeafGeoff.” I worked with “Marty & Shannon in the Morning” for six years as possibly the only mostly deaf on-air personality in the country and our show was rated No. 1 in its target 18-34 demographic. I’m now a producer/entertainment reporter at syracuse.com, the online affiliate of The Post-Standard newspaper but the challenges I face today are the same. At a radio station disc jockey (or as a club DJ), you have to listen to what your audience wants and respond to it. Social media users and website readers will often comment and/or share stories, and it’s the same thing — listening to the audience, responding to them, and continuing to inform and/or entertain. I’m also still a DJ for parties, dances, weddings, events, etc. and I’m constantly listening to music and studying it, watching audiences to see how they react to songs. It’s amazing how hearing a favorite tune can change a person’s mood — or force them to start moonwalking (or shuffling or Gangnam-Styling or whatever) because the music is that infectious. You can watch video of me speaking at TEDxBuffalo here, but please check out the other speakers as well. All had great, unique thoughts to bring to the event and I was happy to be a part of it. Thank you to all who watched and tweeted me their thoughts afterwards, and thank you to Kevin Purdy for inviting me to speak at TEDxBuffalo. If anyone has any follow-up questions or would like to know more, please feel free to email me. Here’s to a new adventure. After more than 6 years working at HOT 107.9 and Clear Channel Syracuse, it is with bittersweet emotion that I announce I’m leaving to start a new adventure. I’ve thoroughly enjoyed my experiences as DeafGeoff, the goofy hard-of-hearing sidekick and morning show producer on “Marty & Shannon in the Morning” and also as Geoff Herbert, the Twitter-happy web producer geek for Clear Channel Syracuse. It’s crazy to think that I have now spent one-quarter of my life here, but I’ve loved it, I’ve loved the people I’ve worked with, and I’ve loved the challenges I’ve had at my job. (Seriously, how many deaf people do you know that work in radio?) I’ve also loved all the amazing listeners and dedicated fans that I’ve come to know through the show and my many crazy stunts (Indiana Jones & The Deaf Kid Of Doom, Win A Date With DeafGeoff, Deaf The Halls, to name a few). It’s been connecting with the audience that’s been truly been my favorite part of the experience. Now it’s time for a new adventure. With a new audience. I will soon be starting a position at Syracuse.com as a Web Producer where I hope you will continue to follow me. I might not end up in a ridiculous costume as often there, but I do still want to connect with you. I’ll also now be updating this blog (deafgeoff.wordpress.com) five days a week as well as frequently updating my new site www.deafgeoff.com, and you can also continue to follow me on Twitter at @deafgeoff.